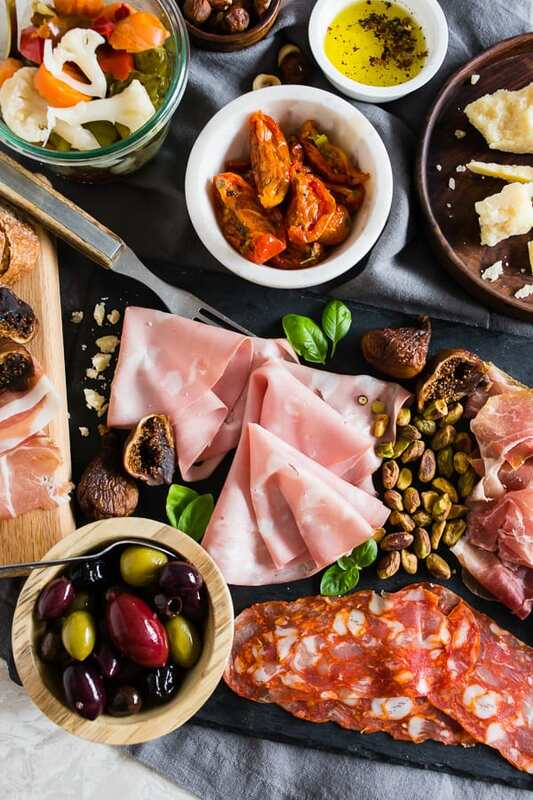 This Italian salumi board is the perfect combination of delicious imported Italian meats, imported Italian cheese, nuts, dried fruit, olives, roasted tomatoes, pickled vegetables and grilled bread. 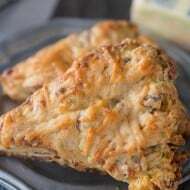 It makes a great appetizer or a simple summer meal – no cooking required! This is a sponsored post written by me on behalf of Italian Trade Commission / The Extraordinary Italian Taste. All opinions are 100% mine. In the middle of summer, there is nothing I love more than a light meal enjoyed out on the patio with a cold glass of wine. I find it hard to eat big meals when it’s 100 degrees outside, and honestly, who wants to feel full when it’s that hot out? That’s why I’m sharing one of my favorite light dinner that doesn’t skimp on quality or taste. 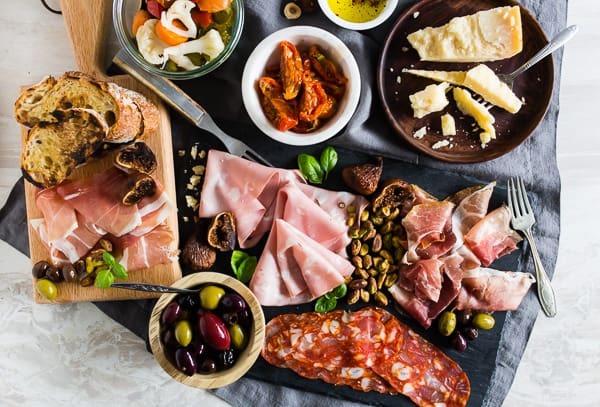 I paired up with Italian Trade Agency to showcase some authentic imported Italian meats that make the BEST summertime dinner (or party approved!) 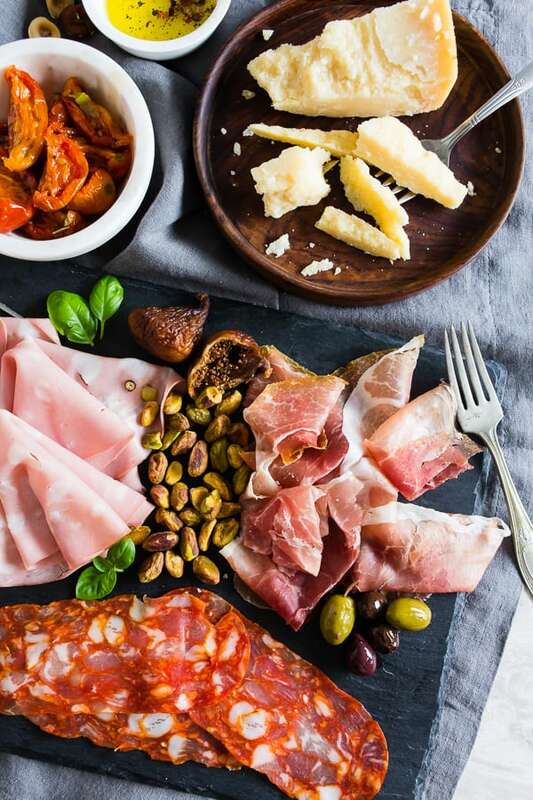 Italian salumi board. I also threw in a wedge of the most amazing cheese I have ever tried, a Parmigiano-Reggiano DOP Vacche Rosse that has that perfect Parmesan bite with the little crunchy crystals that have you craving for more bites. Now, when I’m putting together a salumi board I like to try and combine lots of different flavors with different little snacks to go along. 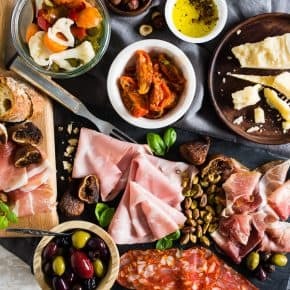 For this board, I paired 4 Italian imported high-quality slices of meat with an imported cheese, dried figs, pistachios, hazelnuts, olives, garlic roasted tomatoes, giardiniera and lots of toasted Italian bread. 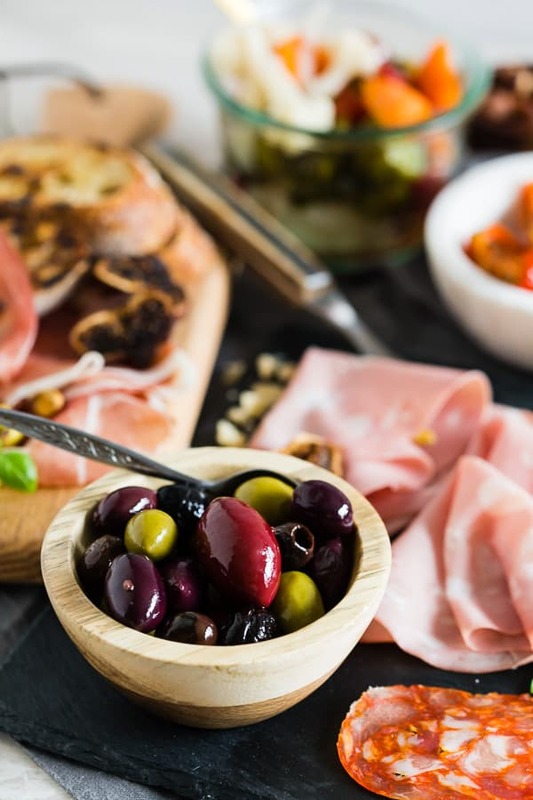 The funny thing about hitting up the grocery store for authentic Italian products is that while many markets do carry truly imported products, there are a lot of imposter products in the store that can make it hard to know if you’re truly buying a legitimate product from Italy. Marketers have spent a lot of money trying to make products looks like legitimate Italian imports, while really they were produced elsewhere. Now, I know you’re probably thinking “um, why do I really care if my products don’t come from Italy?” Well, quality is the major reason. Italian products are highly regulated, labeled and even tell you from what region your products have come from. Remember – just because something looks or sounds Italian doesn’t actually mean it’s from Italy. Always look for that “Made in Italy” label to know you’re truly buying the real deal. For this Italian salumi board I hit up my local Italian market where they were more than happy to not only help me pick out quality imported meats, but went out of their way to explain all the differences, show me the stamps on the meat to show they are imported and even explained how they travel to Italy every summer to visit the farmers where they get some of their imported meats and cheeses. It was the most educational deli trip ever. 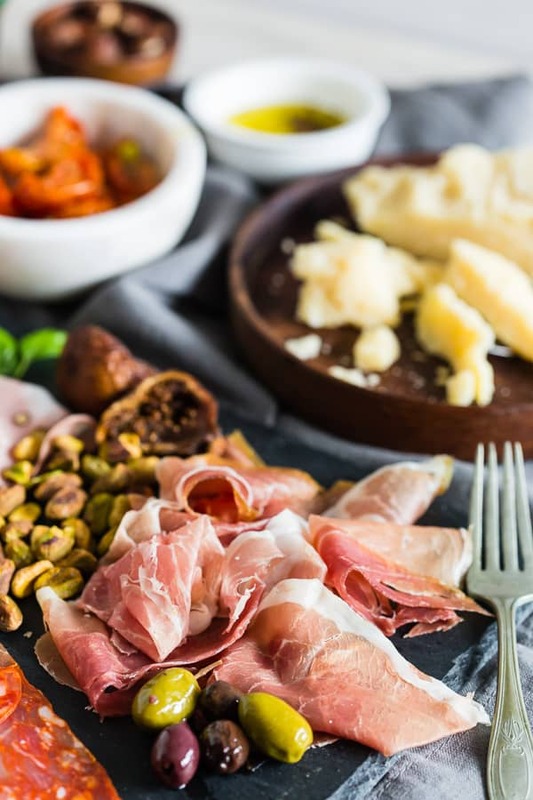 Since I knew I wanted to create a salumi board with lots of different flavors, I went with a few classic meat additions: Prosciutto Toscano PDO, Speck Alto Adige PGI, Mortadella Bologna PGI and some Salami Schiacciata Piccante. While they were all delicious I was pretty sure my husband was going to eat all the Salami Schiacciata Piccante before I could even get a bite. 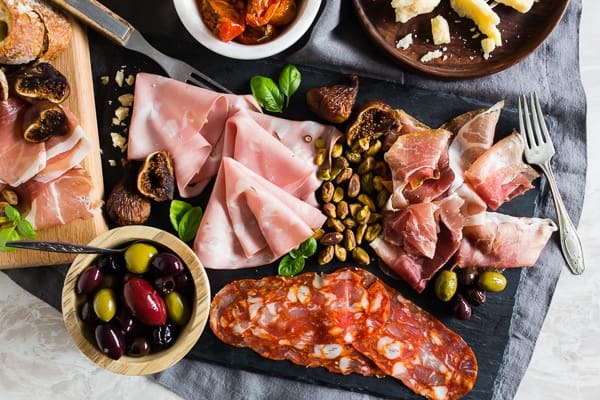 If you find yourself always wondering what to make for a light quick dinner you 100% need to give this Italian salumi board a try. 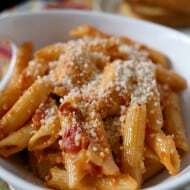 Just make sure you use truly imported Italian meats because that means you’re getting quality, great flavor, and truly authentic Italian cuisine. 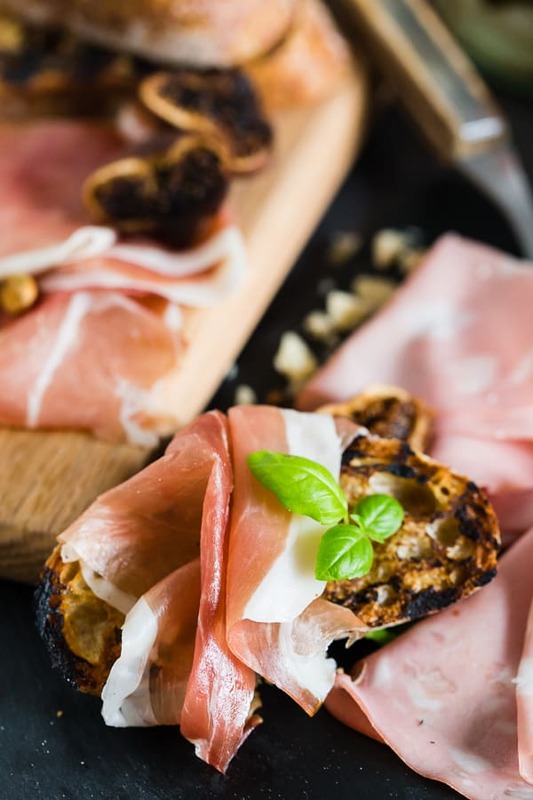 Discover more about premium Italian products! 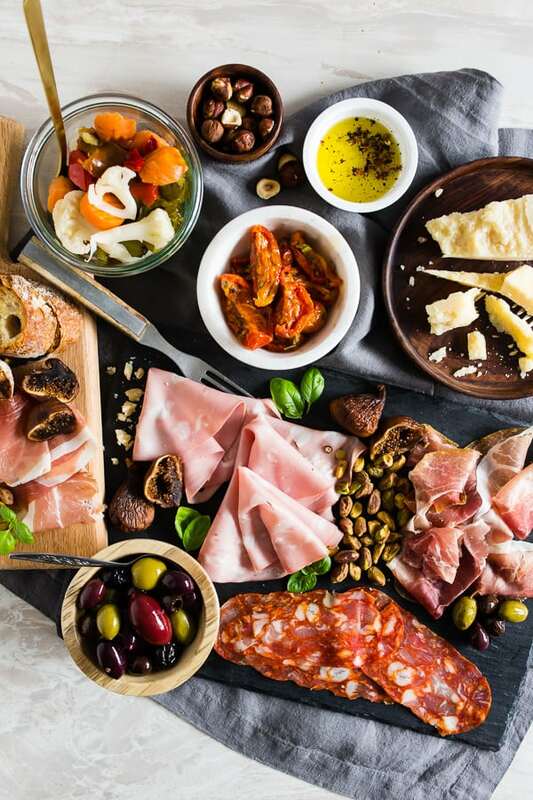 This Italian salumi board is the perfect combination of delicious imported Italian meats, imported Italian cheese, nuts, dried fruit, olives, roasted tomatoes, pickled vegetables and grilled bread. It makes a great appetizer or a simple summer meal - no cooking required! On a large platter or cutting board lay out all items above. I would be perfectly happy eating this for dinner! It has everything you could want!! This is great for a party! 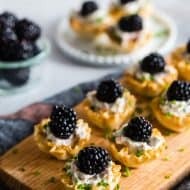 Sometimes it’s fun doing appetizer dinners and this looks like a perfect fit! Such a great spread! This would be great to set out for a girls night in. This is such an awesome idea! Guests will surely be impressed! This is looking all kinds of AMAZING!! !